Solid Bond 300 Tough Epoxy Gel glue is a very strong translucent gel-like epoxy fully waterproof adhesive that can be trowelled up to 1cm thick without slumping. The product will cure to a hard translucent finish within 12-24 hours at temperatures down to 5°C Suitable for timberwork from laminating kitchen bench tops to boat construction. Gap filling ability enables wide cracks to be filled, may be mixed with sawdust or pigments for invisible mending. Where required small fillets of Solid Bond 305 5 Minute Epoxy Glue may be used to hold parts together whilst Solid Bond 300 is curing enabling rapid de-clamping. Steel may be bonded after degreasing and sandblasting. Fittings may be glued to masonry as can steel, stone or ceramics. Any of the above if suitably prepared can be bonded to each other. Damaged polyester and fibreglass is best repaired using epoxy, either Solid Bond 300 or where a larger hole needs laminating use Solid Bond 330 Epoxy Fibreglassing Resin and woven glass. Cracked shower bases can be permanently repaired with Solid Bond 300 as can cracked roof tiles and concrete. Loose bricks can be bonded back into place without the mess of cement. As Solid Bond 300 is waterproof it can be used to refix tiles in swimming pools and when coloured can be used as a grouting system. 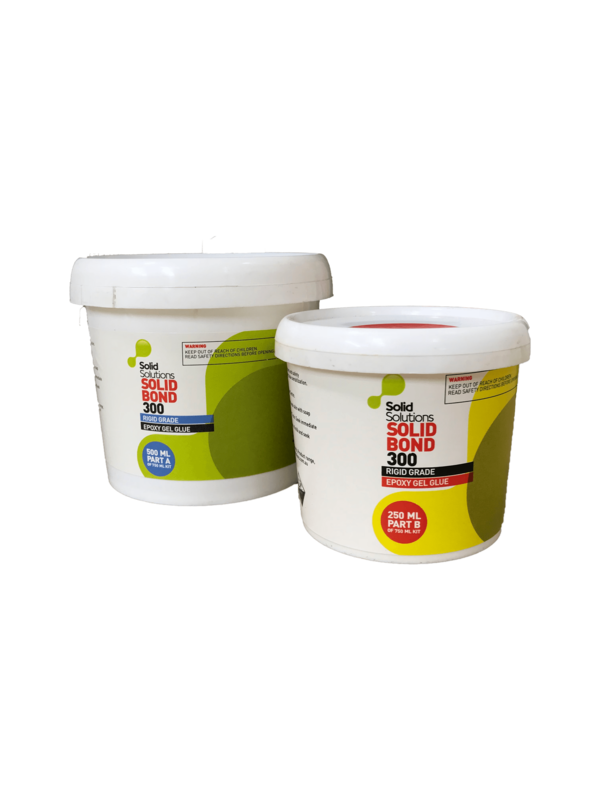 Bonding pebbles to surfaces is a common application of Solid Bond 300 in water features.